A scenic picture taken of a rock cliff next to the freeway with an interesting puffy cloud and blue sky seen above. This photo was taken in Eastern Washington near Steamboat Rock State Park. 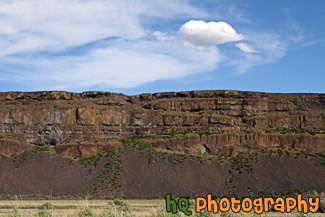 rock cliff, puffy cloud, scenic landscape, rock cliff and puffy cloud, interesting cloud, blue sky, scenic sky, rock mountain wall, eastern washington landscape .